Walk through the palace’s beautiful gardens and get lost inside the famous maze! Save 23% off the Gate Price! Your ticket will be accepted by the attraction up to 7 days after the date you select when booking. We will send you an e-ticket via email. Don’t Miss: Finding your way out of the most famous maze in the history of the World! Here’s how you can visit the British Royal Palaces without paying full price this summer! Pre-book your Royal Attractions as Royal Baby Fever Hits! Escape the hustle and bustle of the city on a visit to Hampton Court Palace and its beautiful gardens. Explore the grand estate that was once home to Henry VIII and hear stories of the famous king’s visits. If you’re lucky you may even see the man himself! 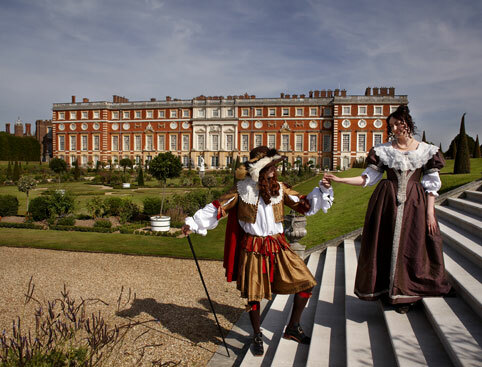 Guided tours (available seasonally) are included with your Hampton Court tickets, during which the Palace’s costumed guides will fill you in on the latest Tudor gossip! Visit England’s greatest medieval hall, one of its oldest theatres - where William Shakespeare’s company performed - and experience the sights and smells of a real Tudor Kitchen. These stunning gardens reach as far as the banks of the River Thames, full of sparkling fountains and thousands of brilliant flowers. Challenge yourself to find the centre of Hampton Court Palace Maze - known as ‘the most famous maze in the history of the world’. See the biggest grape vine in the world, which has been producing yearly crops since it was planted in 1768! Visit during early September and you may get to buy some of the grapes for yourself. Take a relaxing stroll through 700 acres of deer park, where you’ll have beautiful views across the gardens and palace. Set within King Henry VIII’s former Tiltyard, the Magic Garden is a new and unique way for families to explore the palace’s past. Populated by mysterious mythical beasts (including a 25m dragon! 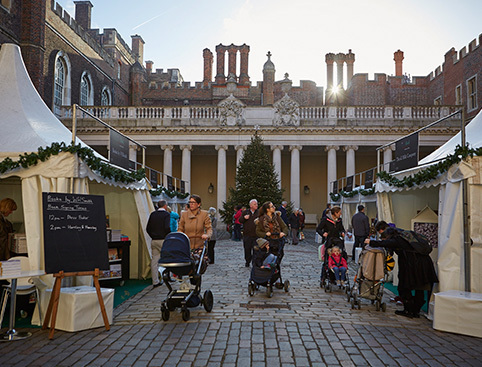 ), with towers to besiege, battlements to storm, and even a secret grotto to discover… PLUS entry is included with standard admission tickets! Open daily all year round, except the 24th - 26th December. 24th March to 25th October: 10am until 6pm. Last admission is at 5pm. 26th October to 28th March: 10am until 4.30pm. Last admission is at 3.30pm. 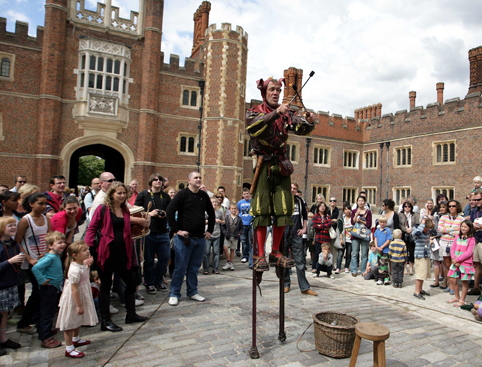 Important: Hampton Court Palace will close at 3pm on 11th June. We apologise for any inconvenience this may cause. Daily guided tours are included with your tickets – just look in your “Plan your day at court” leaflet for the meeting place and time. Audio guides are also available free of charge (subject to availability). You can collect these from the Information Centre. In the case of extreme weather conditions, the Palace and Gardens may close for safety reasons. 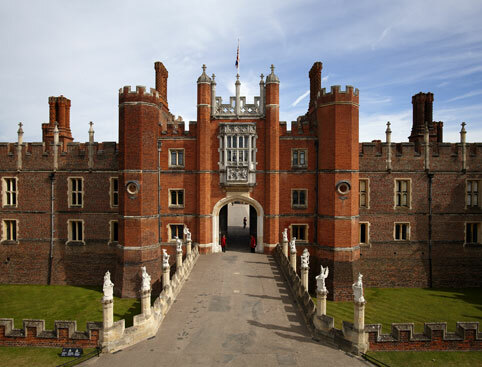 Hampton Court Palace is located next to the River Thames in South West London. It is easily accessible by road from the M25, M3 and M4 - look out for brown attraction signs that will help direct you to the venue. Hampton Court Palace is rated 4.7 out of 5 by 87. Rated 1 out of 5 by Billonline from What A Disaster ! Arrived at the entrance to Hampton Court Palace to only be told our tickets would not scan through. We were told to go back to the main ticket office to have new tickets printed in order to get in. This really delayed s getting in as we had to walk back to the main gate and queue for new tickets. This shortened the tine we could spend at Hampton Court as we had to catch the last boat back to Westminster. I was told this happened all the time to visitors with e-tickets printed at home. System is not fit for purpose ! Rated 5 out of 5 by MillyBa from Nice day out It was beautiful day out. It's so much history and beautiful gardens. Rated 5 out of 5 by Movassaghi from Great for all ages I bought tickets for my family and even my 1 year old enjoyed!! Rated 5 out of 5 by Hong Hong from Fantastic place for one day trip It is a beautiful place to have a few friends together to have funs. We love the beautiful gardens and had a wonderful time. Rated 4 out of 5 by Ashers98 from You can feel the history Had a brilliant time. Full of British culture and history, which is present in re attraction itself and the atmosphere. 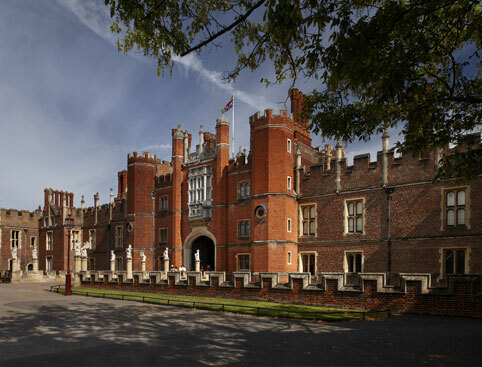 Rated 5 out of 5 by Bhughesnow from Simply wonderful First return to Hampton Court in over 15 years. It was always a favourite place but it is better than ever. The way it is now presented to tell the story of those who lived there brings it to life and is very engaging. My 10 year old was enthralled. Inspirational. Tickets were well priced and easy to buy.